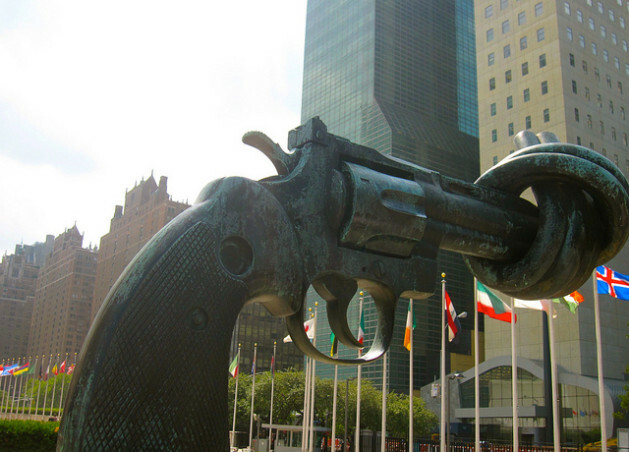 UNITED NATIONS, Apr 2 2013 (IPS) - For many in the international community, the iconic sculpture outside the U.N. Visitors’ Centre appears more prominent today, as the majority of member states tightened its knot by adopting the first ever Arms Trade Treaty (ATT). The General Assembly tallied 154 member states that voted “yes” for the ATT and three that voted “no”, with 23 that abstained. The treaty’s adoption by majority vote followed gruelling negotiations from Mar. 18-28 at U.N. headquarters, which included a botched effort to adopt the text through consensus. It’s not perfect, but maybe it’s not completely broken. The adopted ATT seeks to curb the use of weapons for human rights abuses. The currently unregulated trade has armed child soldiers, perpetuated gender-based violence and fuelled civilian massacres across the world. The ATT legally binds its “States Parties” – or those who ratify the treaty’s text – to report their arms transfers and to assess whether such transfers will reach the hands of human rights and humanitarian law violators. The treaty itself opens for signature on Jun. 3. According to the General Assembly resolution, the ATT’s “entry into force” applies only to those 50+ member states that will have ratified its text – with no legal obligations for others, explained Nikola Jovanovic, spokesperson and adviser to the current president of the General Assembly. “The General Assembly resolutions are not legally binding, but there is political obligation (to) follow up and comply,” he told IPS. On Mar. 28, member states had an opportunity to adopt the ATT through consensual agreement. But Iran, North Korea and Syria made it “crystal clear” that no such consensus was reached, when they blocked the treaty. They cited a litany of reasons, ranging from national security concerns to the threat of non-state actors. The National Rifle Association – a powerful U.S. gun lobby – also expressed dismay over the treaty, citing fears (which were later debunked) that the ATT would restrict U.S. citizens’ second amendment constitutional rights. Critics from civil society point out that the ATT will barely put a dent in the military industrial complex and the global arms trade, a goliath business estimated to be worth 60-70 billion dollars a year. In general, the vast “grey area” that shadows the arms trade – where legal and illegal dealings between governments, defence contractors and arms dealers collude – was seldom brought up during negotiations. The Bolivian delegation abstained from the ATT vote in the General Assembly, for example, and cited the ATT’s ineptness to curb the conflict-driven profits of large defence corporations. While most member states that participated in ATT negotiations from Mar. 18-28 favoured a more robust treaty, “the major suppliers favoured a treaty that would not constrain their ability to sell weapons to their chosen recipients,” said Dr. Natalie J. Goldring, senior fellow in the Center for Peace and Security Studies at GeorgetownUniversity. In the end, Ambassador Peter Woolcott, president of the U.N. conference on the ATT, tilted in favour of the suppliers, Goldring told IPS. While speaking at the GA, the Pakistani delegation – which voted “yes” for the treaty – reflected Goldring’s point. Pakistan noted that such biases should be addressed during the States Parties next review of the ATT. Goldring argued, however, that the treaty – if fully implemented – would indeed affect both arms suppliers and recipients. “Suppliers will be required to give greater attention to human rights and humanitarian concerns before making decisions to transfer weapons,” she said. “For example, ammunition and munitions were included in the treaty, despite U.S. objections,” she said, noting that this is “critically important”, as an estimated 875 million small arms and light weapons are already in circulation. The treaty itself took on three forms during March negotiations. The first was a “legal scrub” of last July’s draft, which member states failed to adopt after the U.S. prevented consensus ahead of its presidential elections. The second draft released by conference president Woolcott was widely criticised by civil society organisations for its “watered down” language. After the final ATT draft was released, Anna MacDonald, head of arms control at Oxfam, told IPS, “There were quite a few improvements that were made to the text (during final negotiations).” She cited changes in the amendments and final provisions section, as well as the improved language on ammunitions and conventional arms. “It’s still not the ideal text,” she said, citing gaps addressing social and economic development, as well as the narrow scope of weapons covered. “But the pressure is very much now on all those governments who want to see strong arms control put into play, to make sure they implement this treaty to the highest possible standards,” she added. Paul Holtom, director of the Arms Transfers Programme at the Stockholm International Peace Research Institute (SIPRI), told IPS, that the ATT included “practical” tools, relevant for “preventing diversion, illicit arms trade and the misuse of weapons”. He noted the practicality of “control lists”, for example, which the treaty requires ratifying nations to have. “That will set out in terms of what items are subject to control for transfers,” he said, noting its usefulness in tackling customs violations. He explained that some nations already have control lists that cover a wider range of weapons than the eight categories included in the treaty. Holtom hopes that through international dialogue, the scope of such weapons included in both national control lists and the ATT will expand. He emphasised the importance of the amendments section of the treaty. “It leaves (the ATT) more open for it to live and develop,” he said. The Conferences of States Parties will allow amendments and protocols to be included, he explained. This way, the treaty’s scope can evolve to cover the technologically evolving weapons being traded today. Holtom cited armed drones as an example of a weapon that was left out in the ATT, but could one day be covered. Holtom also noted the significance of including parts and components in the treaty. In today’s market, he explained, weapons are transferred not only as finished systems, but also the parts and components that make up those systems. “These separate articles in the ATT on ammunition and parts and components are designed to try and block (any) circumvention (and gaps),” he said. “What’s significant is that it (was) negotiated in the U.N.,” said Holtom. Other treaties – on landmines and cluster bombs, for example – were negotiated outside of U.N. headquarters. This has nothing to do with crime and everything to do with crushing freedom. This treaty would not stop Obama and Holder from giving guns to the Mexican drug cartels, arming Al Qaeda and Taliban in Syria, or stop the slaughtering of innocent people going on in Africa and other third world countries. If anyone even thinks of trying to disarm Americans, there’s going to be a lot of dead people really fast. It will cause a civil war. It’s also funny that the anti-gun sculpture was made in Sweden, probably the only country where they are truly free and the government is not trying to disarm their people, but the exact opposite. Their people are required to have fully automatic weapons. They are much more free than the USA, and if I had to choose another country to live in, that would be it. We are supposed to overpower and out-gun our government. That was the whole point, to keep our elected government in check. We are supposed to be a country where we the people are in power, but due to lazy cowards, this is all changing. We are now socialists, and we are a police state, or dictatorship. Soon, there will be only one world government, and nobody is going to like it. Be careful what you wish for. It’s exactly what Hitler wanted. The whole world.